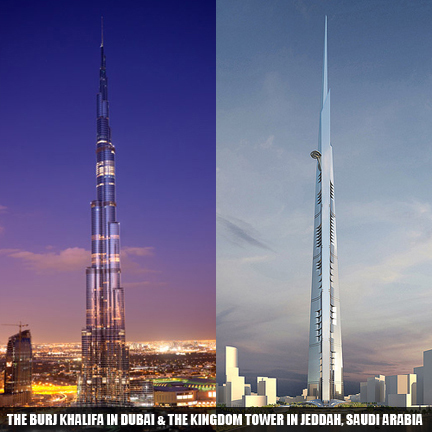 Anything you can do I can do better… that seems to be the case for the the world’s tallest building and the fastest elevators! Currently, the Burj Khalifa in Dubai which was completed in 2010 holds the record at 2716 feet. However, the Kingdom Tower in Jeddah, Saudi Arabia which began construction this January and is scheduled to open in 2017 will likely be the world’s tallest building at 3281 feet! One of the biggest challenges to build so high is elevator tech. Buildings are reaching higher into the sky and travel distances and times are becoming so great that it poses as a drawback for tenants or workers in the building. The challenges are elevator shaft height and speed limits. Elevator cars in the Burj Khalifa and soon to be Kingdom Tower glide upward at a maximum speed up of 32 feet per second for a short elevator commute under 2 minutes. The Shanghai Tower which will be completed in 2014, plans to have the fastest elevator in the world by zipping by at 59 feet per second!